Plans to build an office and apartment block next to a Grade II*-listed former railway station in Cardiff would cause unacceptable harm, it has been claimed. 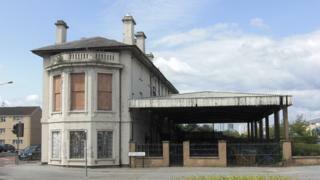 ABA Holdings Ltd wants to renovate and convert the derelict Cardiff Bay Station and link it to a new four-storey building. The new building would house 10 flats, offices and a cafe. But objectors have said the proposed new block was too big and would be "aesthetically jarring". The Victorian Society said the Bute Street station was one of the oldest and most significant railway structures in Wales and last year appeared on its list of the 10 most endangered buildings. It said it supported a sensitive restoration scheme but the current proposal would cause a "high degree of harm to the building and its setting". In its response to the scheme, it added: "What is proposed is little more than a relatively mundane commercial block crudely tacked on to one of Wales' most important historic railway structures." The Ancient Monuments Society agreed the proposals were out of character with the existing building and said a previous application to convert it to a museum would have been more fitting. The Association for Industrial Archaeology said the new building "completely obscures and dominates" the old station, which would have an adverse effect on its setting. Council planners said the cost of restoring the existing building had never been viable and past designs to extend it had "not sat comfortably with those who wished to preserve the building". They added the aesthetic of the planned new building was intended to be in "distinct contrast" to the existing one and said they did not agree with the objections. The proposals have been recommended for approval at a planning meeting on 16 August.